So, that fax machine of yours has finally given up? Im sure you headed to the shops to find a new one, and then realised that they’re incredibly difficult to find. That’s because they’re obsolete! Where to from here? Online fax! This awesome service allows you to send and receive faxes from anywhere in the world- all you need is a fax number. How do you get this fax number? Ok, sign up with us first. Once you’ve done that, we will send you your number. This number allows you full use of all of our services, so get faxing. Download our free fax printer- this is software which allows you to convert any document into a faxable format that you can then send. All you need to use our services is an internet connection. AND you can access your faxes from anywhere in the world. How cool? Any faxes that you receive are stored by us, so that you can view them at any time. Forgot that address mentioned in that document? Don’t worry, just log into your account and have a look. I’m sure you’re thinking about the security of you documents, but rest assured that our servers are secure, and our main concern is you. 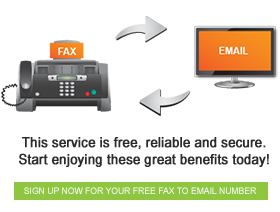 We are South Africa’s leading provider of fax to email, and our services are incredibly easy to use. Despite that, we also have minimal environmental impact because you do not need to use paper, ink, or machines. What more could you ask for?